Coats' disease is a nonhereditary ocular disease, with no systemic manifestation, first described by George Coats in 1908. It occurs more commonly in children and has a clear male predominance (69%). Most patients present clinically with unilateral decreased vision, strabismus, or leukocoria. The most important differential diagnosis is unilateral retinoblastoma, which occurs in the same age group and has some overlapping clinical manifestations., Coats' disease is an idiopathic condition characterized by telangiectatic and aneurysmal retinal vessels and chronic accumulation of subretinal exudates. It is predominantly unilateral occurring mostly in young males, and can cause severe visual loss resulting from exudative retinal detachment. Less commonly, it presents in adulthood and progresses at a slower rate, but with similar features., The visual prognosis depends on the macular involvement. In some cases, the progression produces retinal detachment, glaucoma, and painful eye that may require enucleation. Here, we report a rare case of Coats' disease in a 37-year-old adult male individual to evaluate the abnormalities underlying clinical findings and expected recovery with therapeutic modalities. A 37-year-old male presented to the Ophthalmology outpatient department of a tertiary care medical college and hospital, with the chief complaints of dimness of vision with constricted visual field in his left eye for the past 3 months. He did not complain of photopsias or pain. The patient was a factory worker who developed slow but progressive and gradual deterioration of vision of his left eye. General history revealed no similar occurrence in his family of both paternal and maternal sides. There was no history of trauma, diabetes, hypertension, or any other significant illness. Social history revealed no tobacco use, alcohol use, and illicit drug use. Review of the systems was negative. On ocular examination, visual acuity was 6/6 in the right eye and 6/60 in the affected left eye which was also same on pinhole correction. There was unilateral leukocoria in the left eye. Applanation tonometry found the intraocular pressure to be 16 mmHg in the right eye and 14 mmHg in the left eye. Slit-lamp examination has shown lids/lashes were normal, conjunctiva/sclera was normal, pupils equal, reactive, no apparent pupillary defect, cornea was clear, anterior chamber was deep and quiet, iris had normal architecture, and lens in the affected eye had trace nuclear sclerosis. Dilated fundus examination of the left eye revealed multiple telangiectatic and irregular, dilated aneurysmal retinal vessels, subtotal exudative retinal detachment with extensive deep and subretinal lipid exudates with a well-defined macular edema as shown in [Figure 1]. This case is thus classified as stage 3A disease.,, Direct fluorescein angiography (DFA) showed early and persistent leakage in the abnormal vessels and hypofluorescence corresponding to the subretinal exudates in the left eye that lead to the confirmation of the diagnosis of Coats' disease. Ocular examination and DFA findings were unremarkable in the right eye. We excluded possible infectious causes, autoimmune disease, diabetes, hemoglobinopathy, and performed a chest X-ray and brain computed tomography, all of which turned out normal. Treatment of Coats' disease is comprised of laser photocoagulation and cryotherapy which are often utilized to constrict abnormally dilated retinal vessels and stop the leakage of fluid and lipids. Unsubstantiated off-label use of anti–vascular endothelial growth factor antibodies has also been used with limited success. 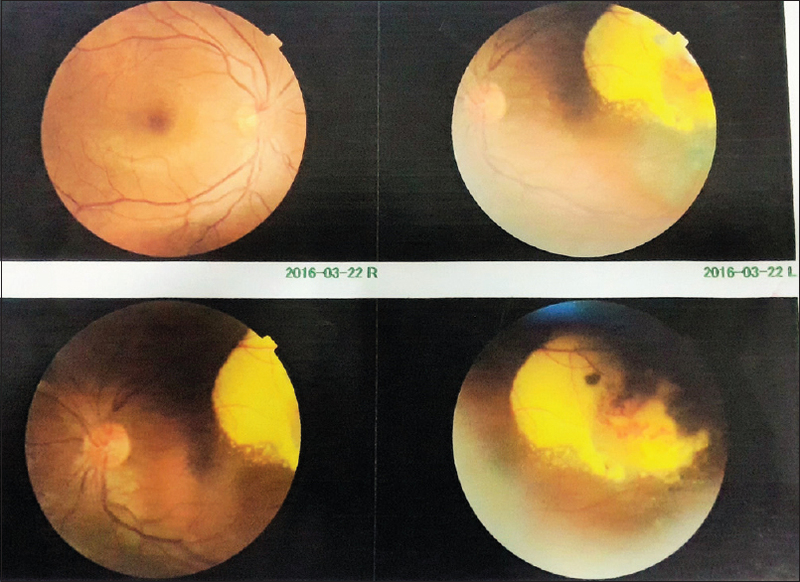 The patient was managed by treating with frequency double Nd: YAG laser photocoagulation in two separate sessions with substantial reduction of exudates and macular oedema. Neodymium-doped Yttrium Aluminum Garnet (Nd: YAG) laser is a solid state laser in which Nd: YAG is used as a laser medium. There were no significant changes after photocoagulation therapy. Intravitreal Triamcinolone could also have been an option to reduce macular edema, and it was considered later on, but the patient refused to have an intravitreal injection. The patient was then followed up monthly in his subsequent visits to the OPD. Progression of the serous detachment of the neuroepithelium occurred and finally progression to macular fibrosis after 2 years of onset of the disease. Coats' disease is the second most common cause of pseudoretinoblastoma. Coats' disease has no associations with any systemic abnormalities. The exact underlying cause is not known, but some cases may be due to somatic mutations in the Norrie disease gene. The patient is considered cured once the ocular manifestations are controlled and systemic treatment is unnecessary. Clinically, the list of differential diagnosis of Coat's disease includes congenital or developmental cataract, retinoblastoma, persistent hyperplastic primary vitreous, and toxocariasis. Those diseases can be distinguished based on angiographic and histopathological findings. Our case is an unusual variant of Coat's disease with presentation in the adulthood and non-responsiveness to existing treatment option even after 2 years of onset of the disease. This case report has documented and illustrated the features of adult variant of Coats' disease, highlighted the timeliness of correct diagnosis, and nature of refractoriness to the present management guidelines. The visual prognosis is directly linked to the stage of disease at the time of presentation. Involvement of the fovea and the presence and extent of retinal detachment have been linked to poor visual prognosis as in our case. The key to better prognosis is earlier detection, which yields earlier treatment intervention. Informed consent was obtained from the patient in a Pre-designed form after explaining him about sharing his clinical finding details with images in public domain. Coats G. Forms of retinal diseases with massive exudation. Roy London Ophthalmol Hosp Rep 1908;17:440-525. Chang MM, McLean IW, Merritt JC. Coats' disease: A study of 62 histologically confirmed cases. J Pediatr Ophthalmol Strabismus 1984;21:163-8. Shields JA, Shields CL, Honavar SG, Demirci H. Clinical variations and complications of coats disease in 150 cases: The 2000 Sanford Gifford memorial lecture. Am J Ophthalmol 2001;131:561-71. Shields JA, Shields CL. Review: Coats disease: The 2001 LuEsther T. Mertz lecture. Retina 2002;22:80-91. Jun JH, Kim YC, Kim KS. Resolution of severe macular edema in adult coats' disease with intravitreal triamcinolone and bevacizumab injection. Korean J Ophthalmol 2008;22:190-3. Miller JW, Walsh AW, Kramer M, Hasan T, Michaud N, Flotte TJ, et al. Photodynamic therapy of experimental choroidal neovascularization using lipoprotein-delivered benzoporphyrin. Arch Ophthalmol 1995;113:810-8. Cakir M, Cekiç O, Yilmaz OF. Combined intravitreal bevacizumab and triamcinolone injection in a child with coats disease. J AAPOS 2008;12:309-11. Coats Disease. NORD; October, 2012. Available from: http://www.rarediseases.org/rare-disease-information/rare-diseases/byID/837/viewFullReport. [Last accessed on 2018 Jun 10]. Del Longo A. Coats disease. Orphanet Encyclopedia; September, 2004. Available from: http://www.orpha.net/data/patho/Pro/en/Coats-FRenPro1645.pdf. [Last accessed on 2018 Jun 08]. Shields JA, Shields CL, Honavar SG, Demirci H, Cater J. Classification and management of coats disease: The 2000 proctor lecture. Am J Ophthalmol 2001;131:572-83. Shields JA, Parsons HM, Shields CL, Shah P. Lesions simulating retinoblastoma. J Pediatr Ophthalmol Strabismus 1991;28:338-40.